The Full Corn Moon is coming up Sept 6, the last full moon of summer. This moon received its name because it marked the time of year when corn was ready for harvest. If it were up to me we’d call it the Back-to-School Full Moon, since September always feels like it’s time to get back to business after a summer of fun! To honour this transition of summer into fall, join me for our live Full Moon meditation on Wednesday, September 6th at 5:45 pm EST / 2:45pm PST / 10:45pm BST (British Summer Time). RSVP here! As I mentioned, the approach of fall always brings with it a feeling that it’s “time to get serious”—with my work, my goals, my schedule. Especially here in the Northern Hemisphere, as the air starts to acquire a bit of a nip and the pleasures of beaches and hammocks and sundresses become impractical, the end of summer is a tangible nudge away from play and back to work. While it feels good to get back to work, this September I want to keep some of that lightness and play that summertime gives me. So what I want to ask this Full Corn Moon is this: is there an element of summertime play that you want to carry with you into the fall? Think of it as harvesting the ripeness of the summer for later use. What is the very best that summer gives you? Is it permission to laze around a bit on a Sunday morning? More time socializing with your best friends on late-night patios and outdoor barbeques? A sense of freedom, a more sensual connection with your body (all those flirty sundresses)? How can you hold onto that quality and bring it forward with you into the fall? 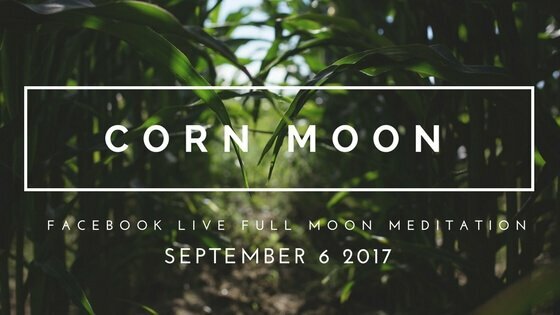 When we come together in the energy of the Full Corn Moon on September 6th, we’ll meditate in the light of this final moon of summer and set our intention to carry that lightness forward with us. Please join me live on Facebook September 6th at 5:45 pm EST / 2:45pm PST / 10:45pm BST. Click here to get details.